Home Yeh Hai Mohabbatein Yeh Hai Mohabbatein 2nd July 2018 Episode Written Update"Raman Hurts His hand Ishita Takes Care of His wound"
Yeh Hai Mohabbatein 2nd July 2018 Episode Written Update"Raman Hurts His hand Ishita Takes Care of His wound"
Episode Starts with Raman Shouts On Ishita that Roshni’s Child is Heir to this house and will come to this House only. Ishita Says I won’t let Any Injustice to Roshni So we will meet in Court Raman Shows her Door and Tells her to go Mrs. Bhalla Tries to Stop her but She Says we will meet at Court. Roshni blames herself for all this But Ishita assures her that She won’t let any come between her and Her Baby. Roshni is worried that Raman Uncle will Drag us to Court But Ishita assures her that She will take Care Court and Everything She tells her to go and Get Some Rest. She Leaves and Ishita Gets Mani’s Call. Mrs.Bhalla Tells Raman That She has Seen Ishita’s Lioness Avatar at Ruhi's Time and I Gave her that Confidence She will Do that Again. Raman assures Mrs.Bhalla that Ishita is Now on Backfoot because She Killed Adi and She thinks I am not thinking about Roshni But I am thinking about Both I will Send Roshni to London there She can Start her Life From Afresh That Child Need Family. That Child will Burden for her that will Remind her that She Lost her love that’s why I am doing for her too. Ruhi asks Are you doing geniunly or Just for Child Raman tells her that I have seen her hard work Before I wasn’t bothered But Now I am, I Know How Hard world is for Single Mother That’s why I am Doing all This. Simmi Hears Raman’s Plan also that No One will tell Ishita about this He warns Ruhi too. Simmi Informs Param and they make a Plan to tell this to Ishita. Ishita meets with Mani and She tells him that She Feels that Raman is Scared Because of this Attacks and All Because He is not Person who will Torture Roshni I Think I Should talk to Raman But Mani Tells That They are so Serious So We Can Go with Court Process I Know a Lawyer and I will Pay Full Fee and When Ishita asks Him why is he Doing all This He shares that He wants to do all this for Aliya. He Shares that Aliya will Lose everything If Roshni goes to Bhalla House Ishita Shares that She is Not So Cleared About this Case May Be Raman is Just doing all this to Make Me irritate She Says She will Meet and Try to Sort out and if not work then she will meet him. Raman is sitting In the Car and Thinking about Him and Ishita How She Admits her Mistake while Doubting On Romi He Also Thinks About their close Moments and Fights too. He Gets Frustrated and Takes out Liquor Bottle and Breaks On Car Bonnet and Hurts His Hand Ishira comes From Somewhere and Sees Raman’s Hand Full of Blood. She Gets Shocked and Tries to takes Out Glass from his hand He Jerks His hand But She Quickly takes Out First Aid Box and Dresses His wound. He Just Stares at her and She Looks at him He Taunts her don’t Be Feel Sad Because this is My Blood and What You have Kept is Also Mine This Doesn’t mean that There will Be No Court Case. She Retorts Back That I will Send you Medicine Apply it and Change the Bandage and Leaves Him Stunned there. Ishita comes home and sees the door open. She asks the guard. Guard says your relative has come. She gets shocked seeing Simmi and asks when did you come here, leave from here. She asks guard to get her out. Simmi says I have come to tell something about Roshni’s future. Ishita says I m very sure that you will just upset Roshni. She asks Roshni not to interfere in this matter, just go and take rest. Roshni goes. Simmi says I know you hate me, even I don’t love you, I want to tell something, you will be thankful for this, Raman has made a few plans for Roshni. Raman comes home and thinks I wish Ishita understood me. Simmi says Raman doesn’t care for Roshni, he just wants the baby, he will meet Roshni and keep this offer, then he won’t need to fight for the baby, whatever you are doing for Adi’s child, I want justice for him, I want baby to be with his mum, not Bhallas, I m a mum and understand the pain of a mum, can I do this bit for the baby, I shall leave now. She goes smiling. Ishita says this woman can’t be trusted, how shall I verify that she is saying the truth. She calls Ruhi and asks does Raman want to send Roshni to London after the baby is born. Ruhi asks who told you. Ishita asks again. Ruhi says actually… Ishita says I got my answer. She calls Mani and says I want to hire that lawyer, can I meet him in the morning. Raman thinks I just hope Ishita understands my point of view, I m thinking for Roshni’s better, I will explain Roshni. She thinks how can you think of separating mum and daughter, I won’t let this happen. Its morning, Raman asks lawyer are the papers ready. Ishita gets Roshni there. She takes Raman aside and says I just wanted to say, stay away from Roshni. She takes Roshni with her. Mrs. Bhalla says she didn’t agree right. He says we will win this case, don’t worry, I called Simmi here, she is going to help us, she will be testifying against Ishita. Simmi says yes, Parmeet and I are always ready to help you. Raman thanks her. Ruhi looks on. 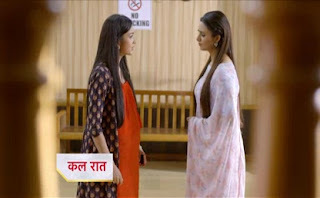 PRECAP :Simmi does Roshni's Brain swashes tells her about London Offer From Raman to Ishita.Roshni asks Question to Ishita and Tells her to let her take Decision for her child.